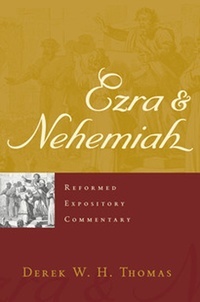 The books of Ezra and Nehemiah tell a vital story of a community revived and restored by God’s grace through gifted individuals—preparing the way for the coming Messiah. In his practical and devotional expository commentary, pastor-theologian Derek W. H. Thomas shows what this gripping narrative can teach us about kingdom life in our own time. In their different ways, Ezra and Nehemiah both prioritized the Word of God and the practice of prayer. If the church of our day is to recover and be renewed, Thomas argues, these commitments are just as vital for us as well.